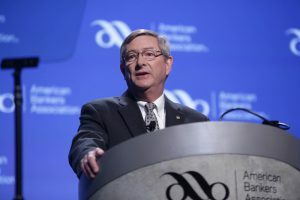 Despite negative headlines and worrying trend lines, banking will survive because bankers “always find a way,” outgoing ABA Chairman Dan Blanton told attendees at ABA's Annual Convention in Nashville, Tenn., today. Despite negative headlines and worrying trend lines, banking will survive because bankers “always find a way,” outgoing American Bankers Association Chairman Dan Blanton told attendees at ABA’s Annual Convention in Nashville, Tenn., today. 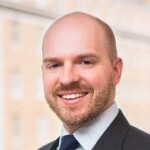 He cited a few instances of ways banker advocacy has moved the needle, such as in prompting regulatory agencies to tailor rules more appropriately to different kinds of banks and urging the FDIC to do more to advance the process of chartering new banks. “We’ve got more to do,” he noted.